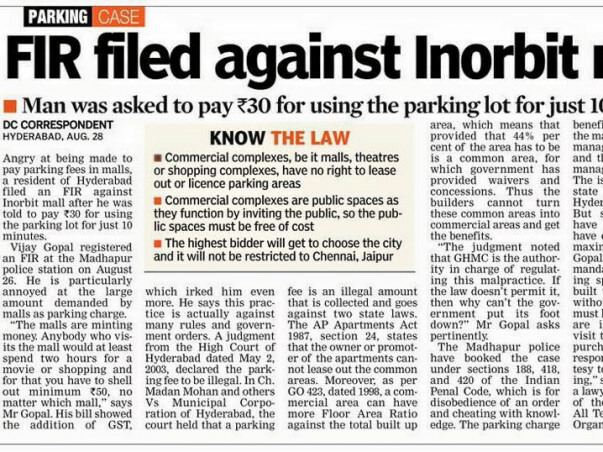 No matter where we go in Hyderabad, chennai, Bangalore, Mumbai or Delhi, we always have the mall, theatre, hospital and educational institutions asking for money when we park the vehicles in their premises. 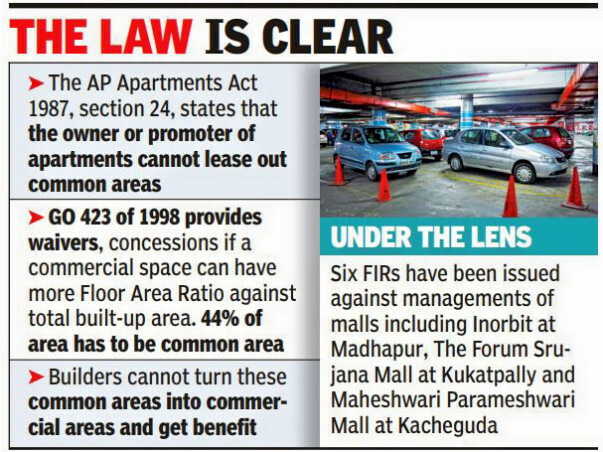 All the malls get benefit of not having to pay property tax on the floors left for parking as they are for the benefit of the visitors. 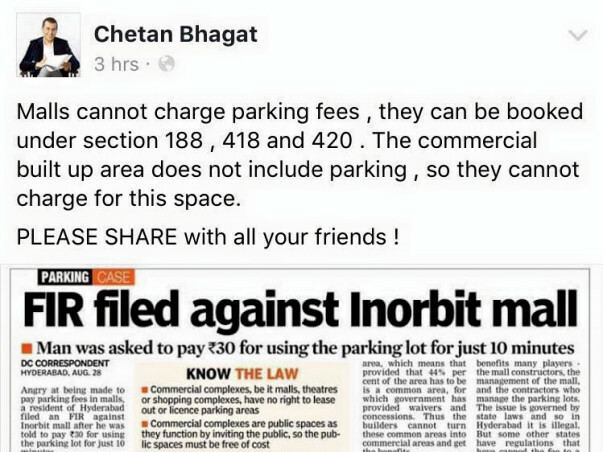 However cashing in on the ignorance of the citizens, the managements charge on an hourly basis costing 50-100/- INR for each hour. This nuisance has to stop. FORUM AGAINST CORRUPTION (FAC) has already filed a Public Interest Litigation (PIL) in the High Court of Telangana to address this issue and we would need your help in taking this fight forward. 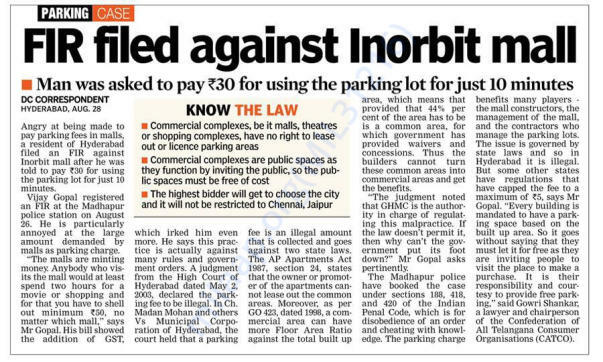 Most of the malls after cases were filed against Inorbit, Forum Srujana Mall, Maheshwari Parmeshwari Complex have reduced their parking charges and now taking only 30/- INR for 4 hours. While FAC is acknowledges the change in the society, we are not satisfied with the output as the parking is supposed to be free. 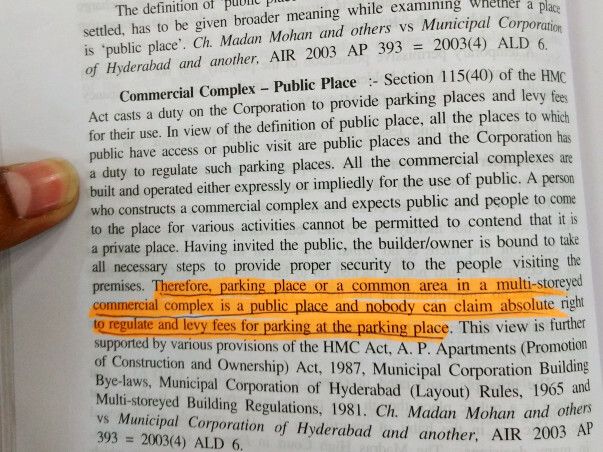 The same was also concluded in 2003 by the Hon'ble High Court of Andhra Pradesh that no private building can money for parking of the vehicles from visitors after getting so many benefits in the form of waiver of property tax, build up extra floors (Floor Aspect Ratio) etc. and turn around and ask visitors to pay money for parking as well. Forum Against Corruption needs your help in taking this fight forward and to address the legal expenses request you to donate whatever you can. While on an average we received 500/- INR from our donors; you are more than welcome to donate as much as you are able to. 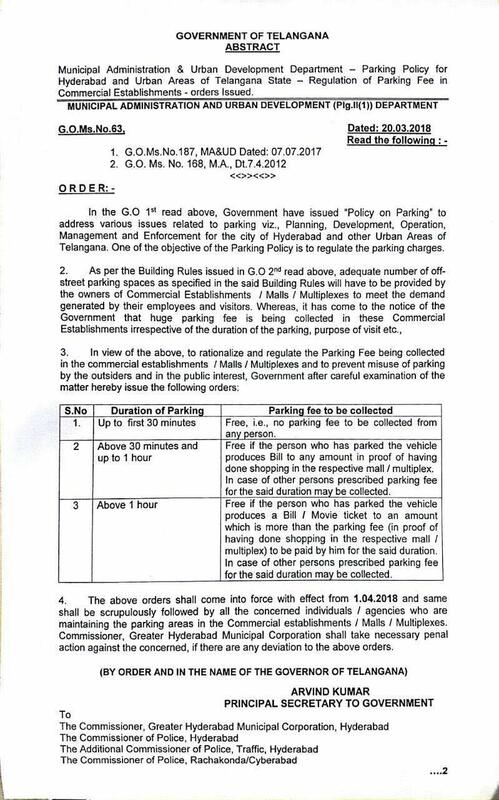 It gives m immense pleasure in informing you all that the parking issue in Telangana has been resolved. This couldn't have been possible without you. We have been successful at persuading the TS govt. in bringing out a policy in this regard. Thank you for all the support and contribution you all have made. FAC assures you that every penny you have contributed here will be put to better use and issues pertaining to the citizen's lives. Firstly, I would like to apologize that I am updating the status pretty late. I would like to thank each one of you for having supported us and making this happen. I glad to inform you all that the State Government of Telangana has issued a G.O. 63 of 2018 M A & U.D making the parking free of cost upon proof of purchase being presented. 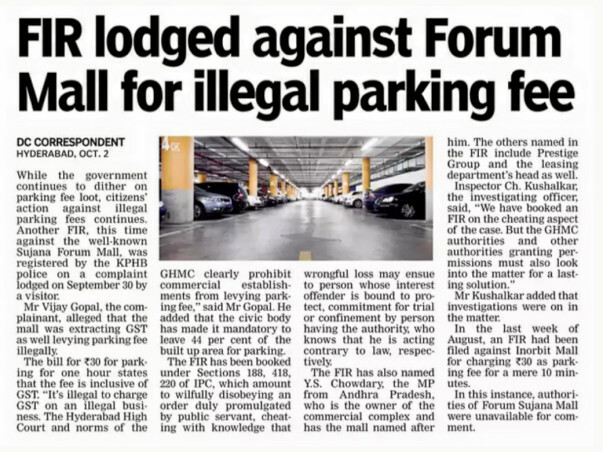 Below is the snapshot of the same and we would like share the same with you and request you to ensure that you do not pay for parking and spread awareness around this. Appreciate all your work towards a greater cause. God bless you! All the best.Keep doing .Supporters always there for ur good thoughts n moves.